Do you struggle between being with God and doing for God? Each day includes a memoir, biblical lesson or inspiring profile, and then suggests a practical action point and prayer. As we approach these words with grace and humility, God will weave them into our own unique stories. Lucinda Secrest McDowell, M.T.S., is a storyteller who delights in weaving grace and mercy into ordinary life situations. 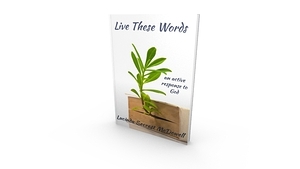 A graduate of Gordon-Conwell Seminary and Furman University, she has authored 11 books, including the new devotional “Live These Words.” She writes from “Sunnyside” cottage in New England.